Updated 3rd Edition October 6, 2017 Available on Amazon — paperback and e-book. Anthropologist & mindfulness teacher in training Sue Doherty explores why when a baby is in our arms, we instinctively begin to rock them back and forth, especially to music. She weaves together fascinating interdisciplinary research in psychology, neuroscience, infant development, and music and movement therapy to explain why and how to engage in the activity so both participates may thrive. 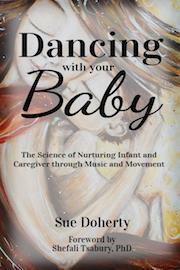 “In Dancing with Your Baby, Sue Doherty artfully demonstrates the power of dance, revealing its ability to enhance an infant’s sense of wellbeing. Writing eloquently, she thoroughly documents the most current research in the fields of infant psychology and neurobiology, articulating the value of dance for creating a strong parent-child connection. Dr. Shefali Tsabary, clinical psychologist and author of The Conscious Parent and Out of Control. Rick Hanson, Ph.D., New York Times best-selling author of Hardwiring Happiness, Buddha’s Brain, Just One Thing, and Mother Nurture. Amber and Meeshi Anjalind, co-founders of GroovaRoo Dance (the babywearing dance group that went viral). Sandeep Gautam is a psychology and neuroscience blogger at The Mouse Trap and at the Psychology Today blog The Fundamental Four. He also blogs at the Creativity Post, and his blog for The Times of India is called Mind Cafe. See a thorough book review in Psychology Today here; and in The Mouse Trap blog. Stories Matter: Applying anthropology to investigate how we thrive throughout the life-cycle, with Sue Doherty. Author of Dancing With Your Baby (2014), enlivening their social, emotional, cognitive, and physical development through our intuitive drive to dance with our baby.